International cooperation aimed at stabilizing the situation in Africa. In 1978 Galina M. Sidorova graduated from Maurice Thorez Moscow State Pedagogical Institute of Foreign Languages. In 1987 she finished her postgraduate studies at the Institute of Oriental Studies of the of Russian Academy of Sciences, majoring in International Relations and Foreign Policy, She successfully defended her PhD thesis on the following topic “French Policy in the North and Tropical Africa in 1974-1981”. In 1994, as a non-degree student, she attended the lectures of the Faculty of the International Relations of the University of Louvain in Belgium. She has worked in the Institute for African Studies since 2001. In 2008-2011 she was the Chair of the centre for scientific information and international relations of the Institute. Galina M. Sidorova has a decade-long job experience in African countries, including Gabon, the Republic of Congo and the DR Congo. She was teaching the Russian language in the Diplomatic Academy of the Ministry for Foreign Affairs of the DR Congo, often delivered lectures in the universities of Lubumbashi (Katanga Province, DRC) and Kinshasa. As a member of the delegation of the United Nations Organization Stabilization Mission in the DR Congo (MONUSCO), Galina M. Sidorova visited different provinces of the country, including the riskiest one – the North Kivu, where military conflicts still continue. Galina M. Sidorova has a number of notes of acknowledgment from the Ministry for Foreign Affairs, the Ministry for Defense; from the UN Mission in the DRC, and others. She was awarded an Honorary Diploma of the Diplomatic Academy of the DR Congo’s Ministry for Foreign Affairs. She is the Honorary Member of the DR Congo’s Writers’ Union. 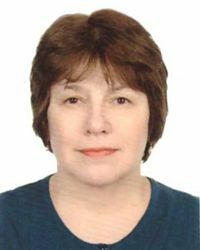 Galina M. Sidorova is the author of more than 100 publications, among them there are “Military conflicts in Africa: the Case of the Democratic Republic of Congo” (2013); “The Republic of Gabon” (1983); “The Republic of Chad” (1989). Sidorova G.M. “Military conflicts in Africa: the Case of the Democratic Republic of Congo” (2013). Sidorova G.M. “The Democratic Republic of Congo”. Reference book and monograph. Chapters: Political System (co-authored by Vinokurov Yury N., Golubev V.M. ), Armed Forces (co-authored by Vinokurov Yury.N. ); Political parties and public organizations (co-authored by Vinokurov Yury.N. ); Mass Media (co-authored by N.V. Dolgovaand Yury N. Vinokurov) );; Theatre (co-authored by N. V. Dolgova and K.S. Kremen); Literature (co-authored by N. V. Dolgova and K.S. Kremen); Dances (co-authored by N. V. Dolgova); Sport (co-authored by R.B.Sokolova). Sidorova G.M., Evdokimov I.D. (the Russian Ambassador in the DRC) “The “Eastern” crisis in the DR Congo and the problem of its settlement”.//International Affairs. 2013. №11. Sidorova G.M. “Conflicts and the problem of ‘Balkanization’ in the DR Congo”//Vestnik of Novosibirsk University, 2013. Vol.12, issue 4. Sidorova G.M. “Security problems and the army reform in the DR Congo”//Proceedings of Kazan University. 2013. Vol.155. Book 3. Part 2. Sidorova G.M. “Problems of ethnic identity in the context of human rights’ studies in the DR Congo”// Vestnik of Yaroslavl Demidov State University, series: humanitarian. 2012. №4/2. Sidorova G.M. “Kinshasa: a course on stability in the Central Africa”//Mezhdunarodnaya zhizn (International Life). 2012.№8. Sidorova G.M. “Russia and international initiatives in Africa”, //Diplomaticheskaya sluzhba (Diplomatic Service). 2011, №3. Sidorova G.M. “International support of peace efforts in the DR Congo in the transitional period” // Vestnik of Saint-Petersburg State University, series 13: Oriental Studies.. African Studies. Issue 4. 2011. Report on “BRICS countries role in settling the situation in Africa” at the Seminar of the Centre for Studies of Russian-African Relations and Foreign Policy of African Countries. Institute for African Studies, Russian Academy of Sciences. December, 3, 2014. Report “Monuments of the Colonial Past: to Save or to Destroy?” at the Seminar on “The Place of the DRC’s culture in the list of UNESCO values ” in the Belgium cultural centre. Kinshasa, September, 17, 2014. “Russian contribution to the Education in the DRC” at the conference in the University of Kinshasa, “Higher and University Education, Scientific Research as a Factor of the Congolese society Development”, Kinshasa (DR Congo), June 25, 2014.